Almost everyone I know is a big fan of the show Parks and Recreation. If you’re not already watching that show, you really should be. If you gave up on it in Season 1, it is SO much better than that now. I had given up on it in Season 2 because I was boycotting NBC after what they did to Conan. Except I wasn’t really boycotting because I still watched 30 Rock and Community. Long story short, watch Parks and Recreation. He’s got those elfin features and spiky hair and a smirk on his face. IT’S IRRESISTIBLE. A girl can only be so strong. 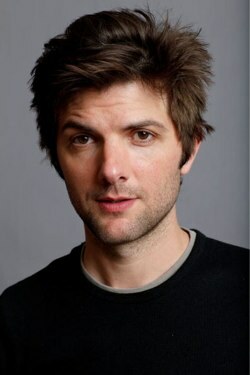 I was in search for a new Adam Scott fix, and I found out he was in another TV show that was on Starz for two seasons. It’s called Party Down, which is about a bunch of wanna-be actors who work for a catering firm in Hollywood. Everyone is trying to get their big break except for Adam Scott’s character, Henry, who is remembered for being “that guy” in “those beer ads”. He has given up on acting and is resigned to being a bartender. I’ve just finished watching Season 1, and started Season 2 tonight. I got totally sucked in and watch the entire Season 1 this weekend. It’s fun to try and spot the guest star. My favorite was the appearance of one of the McPoyle brothers from It’s Always Sunny in Philadelphia as a goth rock star in the first episode of Season 2. Oh and another connection to Sunny is that the shows are directed by Fred Savage. So all in all, if you like off-the-wall TV shows, you’ll enjoy this one a lot. One last bit of information for those of you who like Glee – this show also features Jane Lynch. This entry was posted in TV and tagged adam scott, netflix instant pick, parks and recreation, party down, unhealthy attachments to tv shows on February 21, 2011 by mekkalekkah.